By intentional design, smart click button switch combines multiplex functionality with noble elegance. The switch is available in alloy frame and stainless steel panel, which is durable and wear-resistant. Two groups of LED backlight-character are always bright so it is easy to operate at night, and the safe light will not affect the guests sleep. Press the button, the backlight of button outline will be lit. Classic style for star hotels. As our customers are all over the world and each has his own language, we can change and print the language as per request. The switch is of classic style for star hotels. It is so noble and elegant that it can enhance hotel grade. 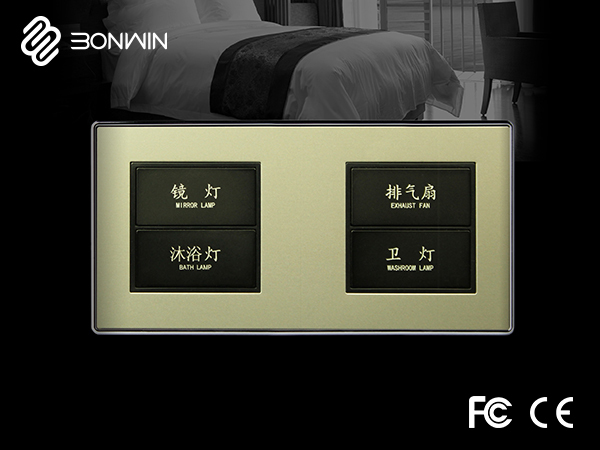 The apperance of Bonwin's smart click button switches is elegant and in top grade. It can enhance hotel's grade. Bonwin's push button on off switch：you just need to push or click the button gently, then the switch will work. We offer switches of single, two or three conjoined panels to you. It was made of alloy frame and stainless steel panel, which means the switch is durable and wear-resistant. Characters on the switch are always bright, so it's easy to operate at night. Also, the safe light will not affect the guests' sleep. If pressing the button, the button outline will be backlighted.